Some reviewers are saying Huawei's MateBook X Pro is the closest you can get to a MacBook Pro without buying in to Apple's ecosystem — and with a starting price of only $1,200, it might actually be a viable alternative to the new 13-inch MacBook Pro, which is priced at a hefty $1,799. 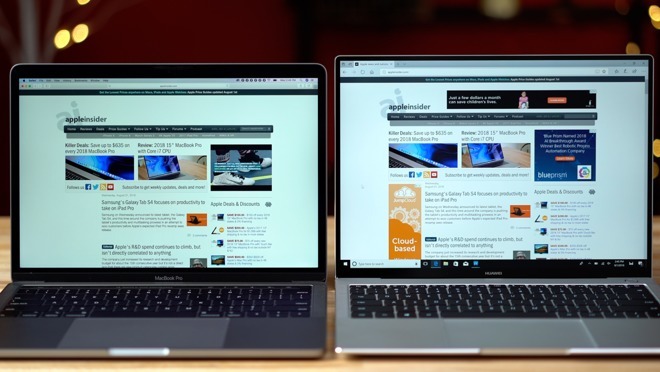 The MacBook Pro is, however, the best all-around 13-inch laptop we've seen so far, so let's put the two side-by-side and see if the MateBook X Pro lives up to the hype. The first thing you'll notice about the MateBook is its large 13.9-inch display. The bezels are thin on all sides thanks to a hidden webcam, which we'll talk about a bit later. Even though the display is quite a bit larger than the MacBook, the chassis is not that much bigger, and both weigh around 3 pounds. The MateBook screen boasts a higher resolution and a taller aspect ratio than that of the MacBook, giving you extra vertical space for surfing the Web. That said, you have to deal with pretty substantial black crop bars when watching standard 16:9-ratio video in fullscreen. The MacBook's screen displays colors more accurately than the MateBook, and it's a bit brighter as well. Another thing we noticed is that the MateBook's screen is highly reflective compared to the MacBook, making it almost unusable outside, even at maximum brightness. The MateBook definitely has better viewing angles, however. The MateBook sports a touchscreen display, which you may not care for if you hate fingerprints. The MacBook also gets True Tone, which adjusts color temperature to make it look more natural in any lighting condition. Before we get to CPU and graphics performance, let's compare a few other hardware features. Both machines have fingerprint sensors, but Apple's Touch ID is more secure thanks to the Secure Enclave co-processor. As a bonus, you can use Touch ID to make Apple Pay purchases with your fingerprint, unlike the MateBook, which only uses its sensor for logins. The MacBook comes with Apple's controversial Touch Bar — and while we haven't really found much use for it yet, some people may end up loving it. Both laptops are equipped with large trackpads, but the MacBook features Force Touch haptic feedback, which simulates clicks just like the solid-state home button on recent iPhones. It feels great, provides even input across the entire trackpad, and is software-customizable. Clicking on the MateBook's trackpad is tougher near the top, and a lot lighter near the bottom, a consequence of its hinge-style design. We also noticed that the mouse cursor freezes sometimes when you start your touch close to edges or corners of the pad, which can get extremely annoying. The MacBook has no such issues. On the audio front, the MateBook X Pro boasts four speakers with deep bass and rich, crisp sound. The MacBook's speakers are still louder though, and there's definitely a lot more bass. Not only that, the sound is more "full," with audibly brighter highs. The keyboards on the laptops are extremely similar, and in fact look almost identical. The MateBook has more key travel, but isn't as "clicky" as the MacBook Pro. This makes the MateBook somewhat quieter, even with Apple's third-generation butterfly keyboard. For typing, the MateBook actually feels a lot more natural thanks to the extra travel. Hidden beneath one of the MateBook's keys is the webcam. This is great for those who are worried about privacy, but also makes for an even worse camera angle than laptops like the new Dell XPS — imagine Skyping with someone and seeing more fingers than face. Another area in which the MacBook one-ups the MateBook is with the Apple-designed T2 chip, which includes an image signal processor to enhance webcam exposure and white balance. The T2 additionally takes care of some other system functions, such as the SSD controller and hardware-based encryption. Speaking of storage, both laptops come with 256-gigabyte SSDs. The MateBook's read speeds were a lot faster than the MacBook's, yet write speeds were about twice as slow. The T2 further enables "Hey Siri" on the new MacBook Pro. There is an equivalent on the MateBook in the form of Microsoft's Cortana, which can also learn your voice and respond to it. For ports, the MateBook gets a USB 3.0 port and two USB-C ports, one of them supporting Thunderbolt 3. It's limited to 20 gigabits per second however, so it'll only support one 4K monitor and could cap the performance of some external GPUs. The MacBook Pro gets four Thunderbolt 3 ports, and all of them can operate at 40 gigabits per second, allowing two 4K displays or one 5K monitor. The MateBook does comes with Huawei's Matedock 2 in the box, giving owners some extra ports including pass-through charging, 4K HMDI, VGA for connecting projectors, and another USB-A port. The laptop also comes with a slightly more powerful wall adapter as well. 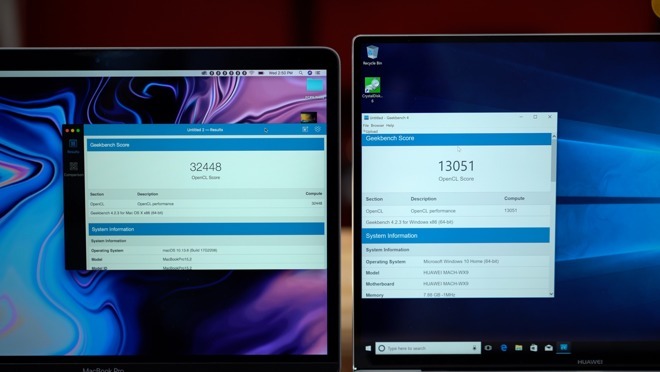 On to performance: both laptops are packing Intel's eighth-generation Core i5 processors, but the MacBook's CPU is clocked at a faster 2.3 gigahertz, and it shows in Geekbench 4's CPU test. The MacBook outdoes the MateBook in single-core performance, and smashes it in multi-core. There's also a pretty massive difference in graphics scores. Conducting a four-run CPU stress-test in Cinebench R15, the MacBook absolutely destroyed the MateBook as expected, scoring 684 versus 384. The MateBook does have a more expensive $1,500 version that packs the same Core i7 in Dell's XPS 13, which is still slower than the processor in the 13-inch MacBook, but also comes with double the RAM, double the storage, and a dedicated graphics card that is considerably more powerful than Apple's graphics hardware. It's honestly a really good deal for the price, though you're only $300 behind the MacBook Pro. Overall we'd have to agree that the MateBook X Pro is probably the closest you can get to Apple's MacBook experience with a Windows rig. It looks extremely similar, the keyboard feels great, and the trackpad is a lot better than those that come with most other Windows laptops. But that's just the thing, it's a Windows laptop. You've got to deal with reliability issues, scaling issues, protecting against viruses and malware, and annoying Windows updates. macOS is so much more reliable, and the Apple ecosystem is great. If you're on a budget and comfortable with Windows, the MateBook X Pro is a good option. If you're looking to purchase Huawei's MateBook X Pro or Apple's 2018 13-inch MacBook Pro with Touch Bar, both are discounted exclusively for AppleInsider readers. Save $100 at B&H Photo now through Aug. 7 when you shop through these special MateBook X Pro and 13" Touch Bar pricing links, bringing the prices down to $1,099 and $1,699 respectively. Adorama is also offering AI readers exclusive savings on the Huawei MateBook X Pro, as well as every 2018 MacBook Pro, with coupon code APINSIDER. Save $40 on the base MateBook X Pro, as well as the upgraded model with 16GB of memory and 512GB of storage space with the promo code (when used with the shopping links below). Every 2018 MacBook Pro is also $75 to $100 off at Adorama with the APINSIDER code. Like the deals above, you must use the special pricing links below to activate the discounts. *To activate these deals, please follow the step-by-step instructions below. B&H will not collect sales tax on orders shipped outside NY & NJ (CO and VT residents, see here). Instructions: To redeem the discounts, simply click through one of the exclusive pricing links in this post using AppleInsider's desktop site and look for the advertised offer. Please note: These deals cannot be activated through the B&H and AppleInsider apps at this time. If you still cannot see the exclusive price using the desktop site, all is not lost! Need help? Send us a note at [email protected] and we will do our best to assist. *Price with coupon code APINSIDER. Adorama will not collect sales tax on orders shipped outside NY & NJ. System qualifies for no interest when paid in full within 12 months using the Adorama Credit Card.